The Yuba River is very unique in its geography. During the decades of mining after the discovery of gold, the river was turned into a chalky off color mess that was virtually uninhabitable. When gold became more difficult to find, mining dredgers were used to remove thousands of rocks from below the Earth's surface to find the precious metal. The famous ponds of the Yuba goldfields were the results of such practices. Much of the ecosystem was lost as man ripped apart the mountains to find the precious element. To this day the remaining remnants of the past can still be found throughout the river. Concrete pillars, pieces of bridges, mounds of rocks, and endless fields of stone are some of the objects you will find when exploring this river. The Yuba river has recovered quite well since the turn of the century with many native species returning to call the river their home. 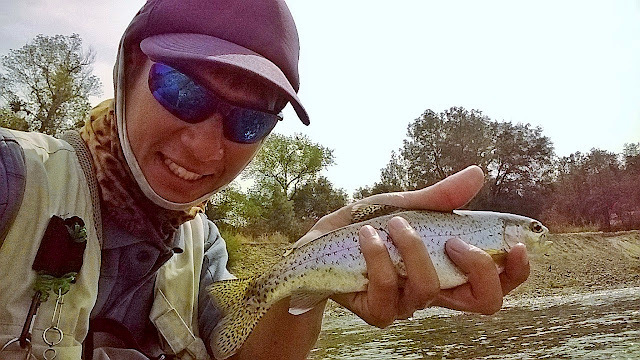 With the flows lowered to >600cfs for the rest of the year, fishing has become a little bit more challenging. The water is low and is gin clear. I was hoping to fish the egg bite but I didn't see a single salmon or redd while fishing. 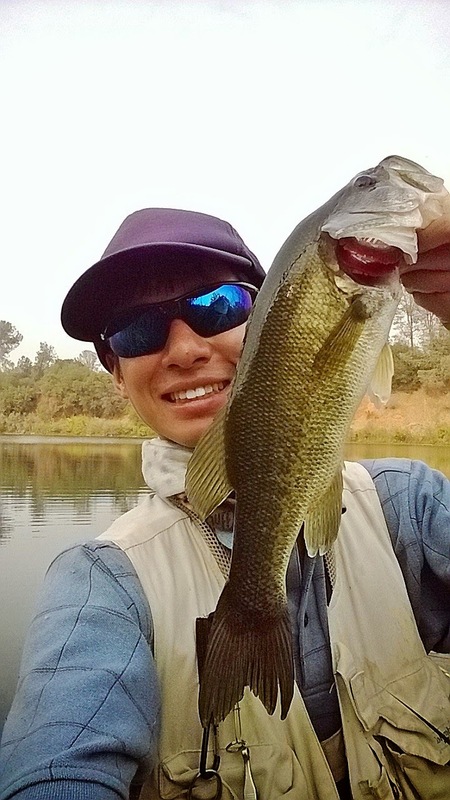 Most of the fish I hooked or caught were less than 14". There were a few anglers out but not too many. The sky was very overcast from the wildfires near by. These fish are tough and you gotta be tougher to catch them. I remember when I was a kid, on a hot summers day my uncle took my dad and I out to fish the dredger ponds of the Yuba goldfields. My uncle had access to the ponds because the owners got finally got fed up with kicking him out so many times. Once we were through the gates we hiked all the way out to the numerous ponds that were just full of hungry 14"+ largemouth bass. I got skunked but my uncle and dad caught some of the biggest bass I had ever seen, the fishing there was amazing. The majority of the Yuba goldfields is on private property and public access is extreme limited. If caught trespassing you will be fined and told to leave. Its good to do your homework before heading to the goldfields. After fishing for trout I decided to hit up a pond that was on the public map. The same experience I had when I was a kid was relived, except this time I didn't get skunked. As I got to the pond I scouted it out to make sure it wasn't a dead pond. I saw a few bass and a couple of bluegills and was relieved. As I reached down to my vest to grab my streamer box I realized that I left it in the car. No worries though. These fish had never seen a fly before and were hungry as heck. I caught a bunch of fish on every single fly but exceptionally well with a stonefly nymph. 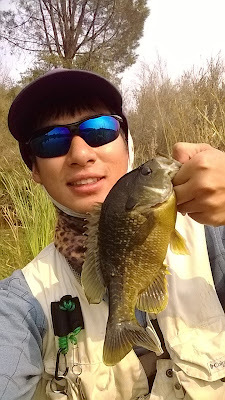 I caught some of the biggest bluegills that I had ever seen and a lot of nice size bass. My goal was to find a trophy fish. Although I didn't get my trophy, I did manage to catch a nice 17" bass. This made me wonder why I was fishing for trout for most of the day. The hike back to my car was a killer, I ran out of water and it was hotter than hell in my waders. It just goes to show that there is always good fishing if your willing to go the extra mile to look for it.